The Omega Workshops was a short-lived but influential artists’ co-operative which formed as an offshoot of the Bloomsbury Group. 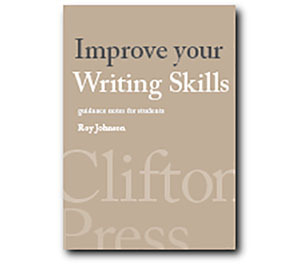 It was the brainchild of Roger Fry who had the philanthropic notion of a self-help scheme for hard-up artists who would create goods of simple but Post-Impressionist modern design. It was partly a reaction against the drabness of mass-produced household goods, but it did not have any of the socialist ideology of William Morris’s earlier Arts and Crafts movement. It opened in 1913 at the worst possible time in commercial terms, at 33 Fitzroy Square in the heart of Bloomsbury. Vanessa Bell, Duncan Grant, and Roger Fry were named as directors, and the premises included both public showrooms as well as artists’ studios. Although the works were produced by people we now see as influential members of the modernist movement, individual productions were made anonymously, signed only with the letter Omega. Artists worked three and a half days a week, for which they were paid thirty shillings. The opening was regarded as nothing short of scandalous. This was a time when popular opinion, fanned by a largely reactionary press, was sceptical to the point of hostility on matters of modern art – especially when it was coupled to something as daring as interior design. 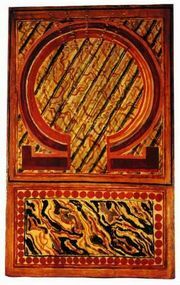 A number of famous names were associated with the workshop: at one time or another Henri Gaudier-Brzeska, Paul Nash, David Bomberg, William Roberts, and Mark Gertler all had connections with the Omega. In 1915 Omega started to introduce clothing into the repertoire, inspired by both the costumes of the Ballets Russes and Duncan Grant’s theatre designs. 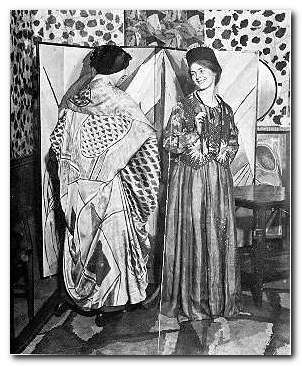 Avid supporters included the flamboyant dresser and socialite Ottoline Morrell as well as the famous bohemian artist (and alcoholic) Nina Hamnet who helped by modelling the clothes. The war years were difficult for Omega, because many of the principal figures were out of London, working on various agricultural projects as conscientious objectors. Whilst Roger Fry continued to support Omega in London, Vanessa Bell and Duncan Grant moved to Charleston in Sussex, where they put their efforts into decorating the entire house in Omega style – an effort which is now maintained by the National Trust. Bloomsbury prevailed on all its high society contacts to patronise the workshop, and some commissions for interior house designs were forthcoming from people such as Mary Hutchinson – who was Clive Bell’s mistress. But the reputation of the workshops was not helped by the fact that many of its products were poorly constructed. The biggest commercial success of the Omega was its final closing down sale in 1919, when everything went for half price. Many of the late twentieth-century and contemporary trends are in themselves tributes to the influence of the Charleston artists, to the Diaghilev ballet designers, to the aesthetes, to Omega, and to the members of the Arts and Crafts movement. The modern fashionable interior pays homage to a creative urge amongst a relatively small sub-section of society in the early decades of the twentieth century. So much of what those artists did has been assimilated and re-assimilated, that one should not be surprised that their tastes are yet again being re-cycled for the World of Interiors readership, even if their origins are not always acknowledged. 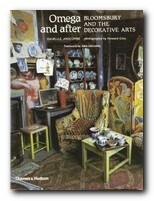 Omega and After is a beautifully illustrated account of the workshops and their aftermath. It focuses on the three principals – Roger Fry, Vanessa Bell, and Duncan Grant, tracing their artistic production (and their tangled personal relationships) from 1913 to the interwar years. Even when the workshops closed, Grant and Bell continued their interior design work in their decorated house at Charleston. 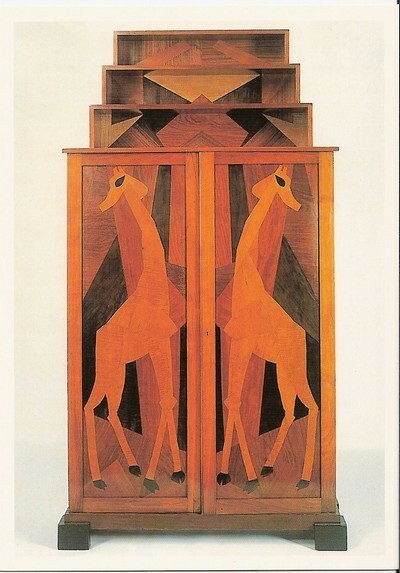 The Omega Workshops had a lasting influence on interior design in the post-war years. This is a rich collection of quite rare pictures, portraits and sketches.